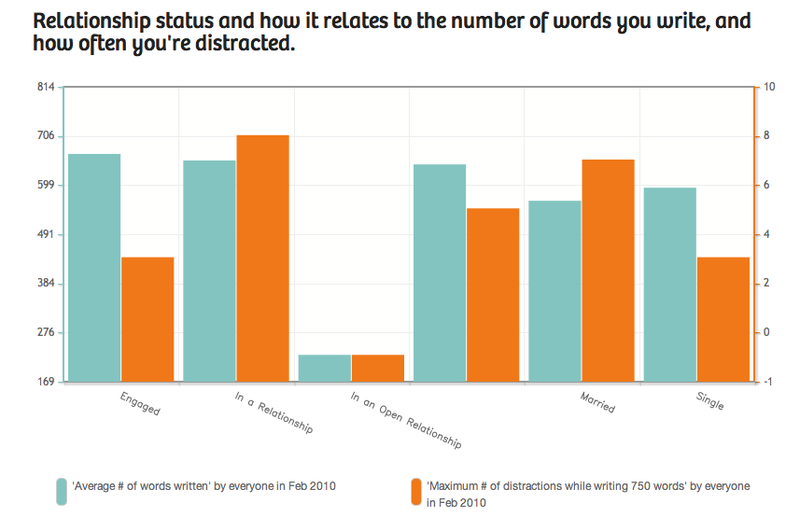 Thanks to a tip-off from Kate Ho yesterday, I’ve been looking at automatically generated writing stats on the 750words website. The accuracy of the analysis I’m not qualified to comment on, but it uses the Regressive Imagery Dictionary (for the emotional analysis), and LIWC (Linguistic Inquiry and Word Count). It’s a really cute system that plays well with the format of the website as a whole: you’re rewarded for typing 750 words on a daily basis, which ‘badges’ being unlocked for achieving certain numbers of days writing in a row. Your recent writing and your average writing are compared against the world average for levels of different emotions (happy/sad/anxious/affectionate/self-important/self-expressive/upset). The maturity is rated on the ‘PG’ scale and separately for swearing, sexual content and violence. Your main concerns are also ranked (relationships/ religion/ eating&drinking/ leisure/ death/ family/ home/ money/ work/ success. Along with the usual word counters it also ranks the main focus of your time orientation, use of sight/hearing/touch, and as section called ‘us & them’ which i’m still to properly figure out. I’m also still to figure out the metadata option, but it seems to be more about content tracking than stylistics. All in all, it’s a really neat way of gaining perspective on personal writing processes, and the kind of graphical layout i’m interested in developing for the writers’ toolkit. Where my plans diverge, however, is that I want the analysis to be trackable on a specific text, so that the tool is used to develop the writing rather than the writer. I would also like it on the public record just how much I adore the ‘explore’ section of the site, which correlates writing data with other data (e.g. 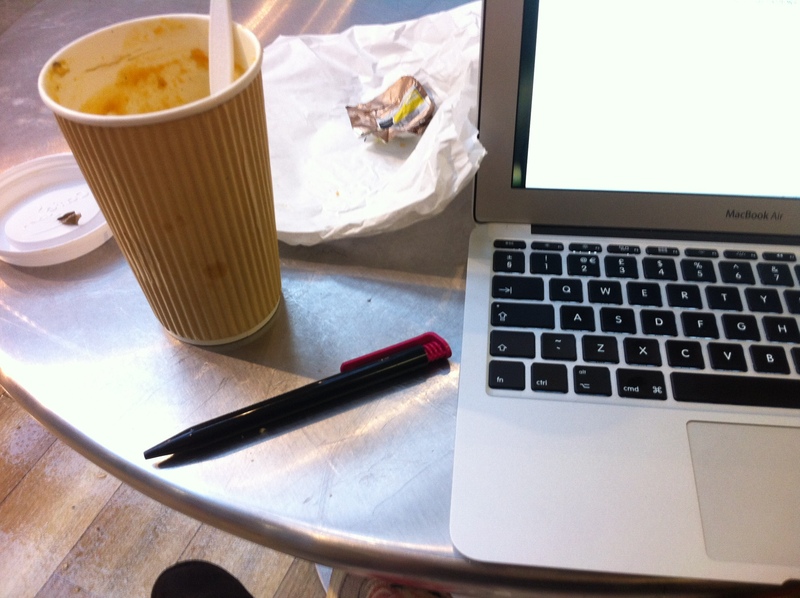 relationship status if you’ve signed onto the site through Facebook Connect, or the weather at the location of your IP address) to make small, almost philosophical statements about the wider view of a writer’s life. If it were possible to marry an idea, I’d be down on one knee, holding out a small box from Cartier. After a morning spent of editing yesterday’s writing footage, I had an intellectual switchover and attended a seminar on ‘Expectation Propagation (from a physicists’ point of view)’ by Prof. Dr. Manfred Opper of the Technische Universität, Berlin. Unsurprisingly, I didn’t understand any of the technicalities; I haven’t studied algebra for about a decade and a half. However, by listening ‘between the lines’ I had a very pleasant hour making philosophical links between ideas, especially around approaches to reality. My favourite repeated phrase from the seminar was ‘it has a real part and an imaginary part’. My understanding of the talk (apologies to Prof. Dr. Opper for my spurious take on it) was that models such as EP are a way of approaching the truth. As such, they are an approximation rather than the thing itself. Models which do not share the same beliefs will therefore not work constructively together (such as the KL condition ruling out Ising models, in this case). This struck me as having certain similarities with storytelling. When entering the world of a fictional narrative, the reader agrees to willingly suspend disbelief in order to absorb a wider lesson which impacts on the ‘truth’ of existence rather than the ‘reality’ of existence. Two narratives set in the same story world (diegesis) can co-exist harmoniously. Two narratives set in different story worlds will clash: they are designed to approach the ‘truth’ in such a way that makes it unhelpful to attempt to put them together. Talent: developing and making the most of the people: the students, lecturers, researchers, and other staff. Disruption: goading the researchers to come up with something different: hopefully leading in the longer term to innovation, which Colin defined as economically or socially useful disruption. Unsurprisingly, I was taken with the idea of disruption: of producing something which is useful in an unspecific fashion simply because it exists, without the pressure of being useful in a specific domain. Perhaps that should be a tagline for creativity and the joys of the creative process. Calling it disruption rather than creativity is in itself provocative, bringing in connotations that this kind of activity might hinder other plans rather than simply create new ones. Food for thought. Last night I finished Halting State by Charles Stross, described by the author as ‘a thriller set in the software houses that write multiplayer games’. I’m not a thriller fan, but it was set in a futuristic Edinburgh, used lots of coding language, and was lent to me by a friend (thank you Addy!) so I decided to give it a chance. Definitely the kind of book i’d recommend to certain people, not the kind of thing I’d read again myself; too ‘fast-paced’, and I think a lot of the software in-jokes were lost on me due to my utter lack of expert knowledge. Due to the weekly commute between Edinburgh and Newcastle I seem to be halfway through about five books in each location (some related to the residency, some to other work, some just for fun), so it was actually a relief to finally finish one of them. 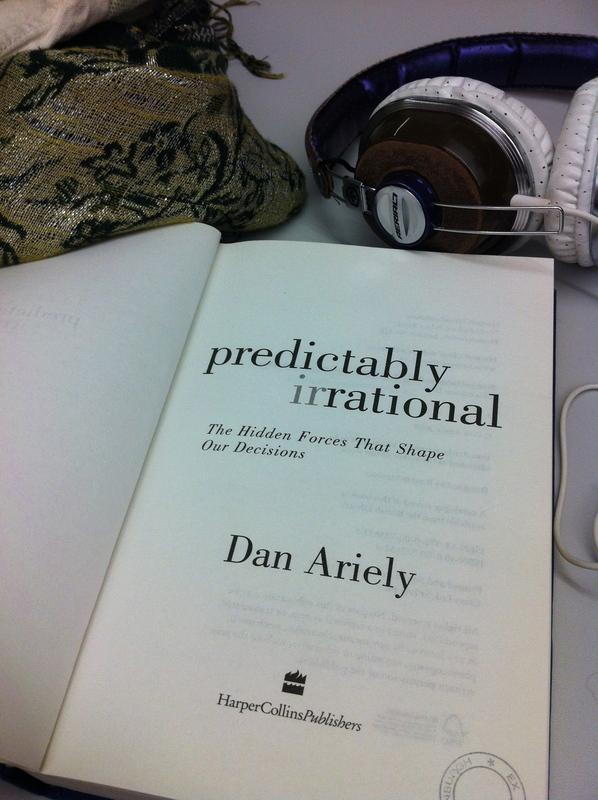 In the spirit of soldiering on I’m taking Predictably Irrational: The Hidden Forces That Shape Our Decisions by Dan Ariely on the train with me tonight.